Probably the most impressive home theater I’ve seen in my life is built in Palm Beach, Florida. 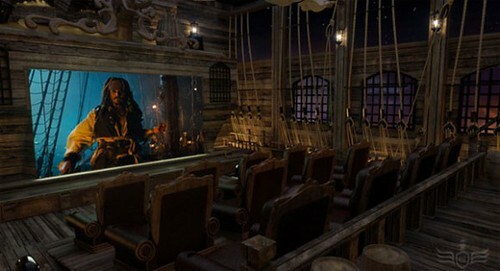 It includes an Entrance Area/Ticketing Booth, the Pirate Tavern/Lobby, where you can take a shot of rum between shows and the unique screening room with twelve sits which looks like a deck of a Pirate ship. As I already mentioned that project is under construction. So, no any “live” pictures are available yet. Hope the home theater will have the same amazing look in reality as on rendered images.